One of the biggest trends in outdoor living spaces is outdoor kitchens. It is especially appropriate for the year round warmth in southern Florida. Today’s outdoor kitchens are much more elaborate than the traditional outdoor grill. They can be as simple or grand as the homeowner desires. The basics of an outdoor kitchen include a grill, a sink, cooking area, a refrigerator, and an island or counter. You can order these from specialty shops, have them custom made and professionally installed, or go to your large local home improvement store for a pre-made one. Some of the added accessories may include sinks, beer taps, wine coolers, pizza ovens, warming trays, and cabinets and storage. A custom outdoor kitchen can provide unlimited possibilities. Another outdoor living space that you will find in the majority of the Southwest Florida homes is a lanai. When I lived up north, I never heard of a lanai. Most of the outdoor rooms up there were called a porch, patio, deck, or three season room. A lanai is an outdoor screened enclosed living space usually with a roof. Lanai’s are great for entertaining, dining, and relaxing. The warm climate of Florida allows the lanai to be additional living space, however, lanai’s are not included in the square footage of a listing on a home for sale. Traditionally a lanai will have outdoor patio furniture and possibly an outdoor rug and plants. Some people use outdoor acoustics such as a television, stereo, and speakers to add to the ambiance. 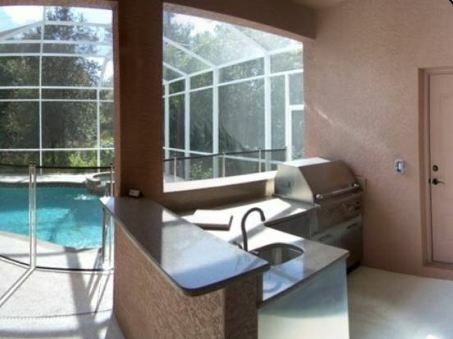 A third outdoor living area in Florida is an in-ground swimming pool. Many of the homes that have swimming pools are called caged pools. This is a pool with a screen enclosure. Swimming pools and spas can be extended off of the lanai giving a larger all-in-one outdoor living area. A swimming pool will make your home more beautiful and valuable. Pool construction companies offer a variety of designs including a complex of gardens, islands and decking in a variety of stone, brick pavers, coral rock and other natural elements. Fountains, waterfalls, rock gardens, reflective ponds, foot bridges and colorful lighting create drama and add elegance. A very dramatic effect is the vanishing edge pool, where the water seems to disappear into the horizon or blend into a body of water or into the landscape. Living in a sub-tropical climate allows for endless possibilities in outdoor living. Come experience the lifestyle. For more information or recommendations of companies to help you add one of these outdoor living spaces to your home, contact me today at tammyhayesre@gmail.com.